Flower beds add color and beauty to the front yard of a home. When planning flower beds for the front yard keep in mind the landscaping rule of balance. Step back and look at the entire landscape, and design the flowerbeds so one side of the landscape has flowerbeds and other features that are the same shape or size as the other side. This gives the landscape a professional look. Also, use the same colors or types of flowers on one side of the landscape as the other, this also creates as sense of balance. Always choose plants that are adapted to your area and the level of sunlight and moisture available. Designate the location of the new flower beds in your front yard. The best way to mark off the area for the flower beds is to use a long garden hose. The hose is flexible and easy to move around. 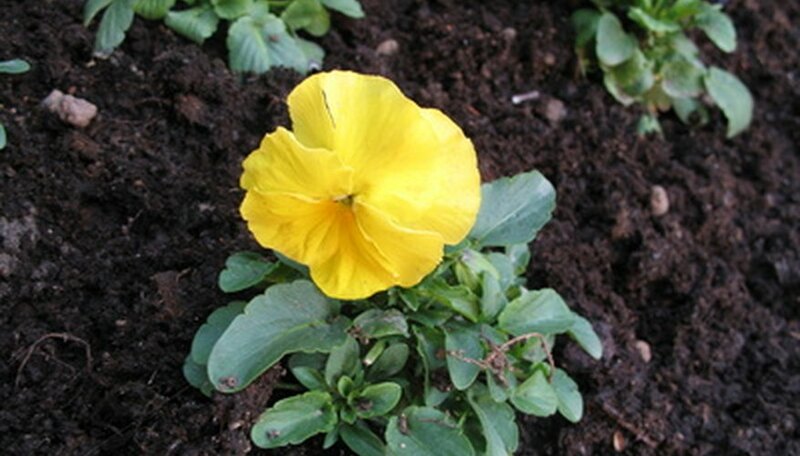 The borders of a flower bed look best if they are soft and flowing rather than sharp or angular. Take as much time is needed to mark off the flower beds on both sides of the front yard until they are in balance with each other. Typical places for flower beds are along the front of the house, along each side of a walkway or around a permanent structure, like a statue or a tree. Turn the top 6 inches of soil over using a shovel or tiller. This is to loosen the soil as well as kill the top layer of grass without the need to add more soil once the sod is removed. Pulverize the soil with a hoe and shovel and rake out as much grass and weeds as possible. Rake the area smooth. Water the area well and keep it damp for about two weeks while new weed and grass seeds begin to sprout and grow. Spray the newly sprouted grass and weed seeds with a weed killer containing glyphosate. Glyphosate is the active ingredient in Roundup weed killer. Do not use any other type of weed killer, because glyphosate does not stay active in the soil after it kills the weeds and grasses. Wait two weeks to be sure all vegetation is dead. Choose plants suitable for your climate and the amount of sun the flower beds receive. Group plants by their water requirements and level of care you can expect to give them. Plants that have high water or fertilizer requirements should not be planted by plants that prefer dry or less fertile soil. A good source of plant ideas is your local County Agricultural Extension Office. Most offices carry a list of plants suitable for your landscape. Spread a 2-inch layer of compost over the prepared planting area, along with the amount of granulated organic fertilizer recommended on the fertilizer container label. Work the compost and fertilizer into the top 3 inches of soil with a hoe, and rake the area smooth. Lay any drip irrigation tape into the flower bed at this time. If the flower bed is to be seen from one side, such as against a wall, plant the plants that will get taller in the back, plants that are medium height in the middle and smaller or border plants in the front. Space plants according to planting instructions on the plant description. Crowding plants will give the landscape a weedy or unkempt look. If the flower bed is going to be seen from all sides, plant the taller plants in the middle. Spread a 1- to 2-inch layer of mulch over the irrigation tape and the soil around the plants to conserve moisture and make the beds more attractive. Use bricks, stone or preformed edging material between the flower bed and the lawn to keep grass from growing into the bed. Be sure to use the same material for borders throughout the landscape to add uniformity and to create a professional look.